As many of you know, our transcriptionists are a dedicated, passionate team that we’re proud to have on board. With a focus on high quality and an attention to detail, it’s great to shed light on these hard-working members of the Edoc team. 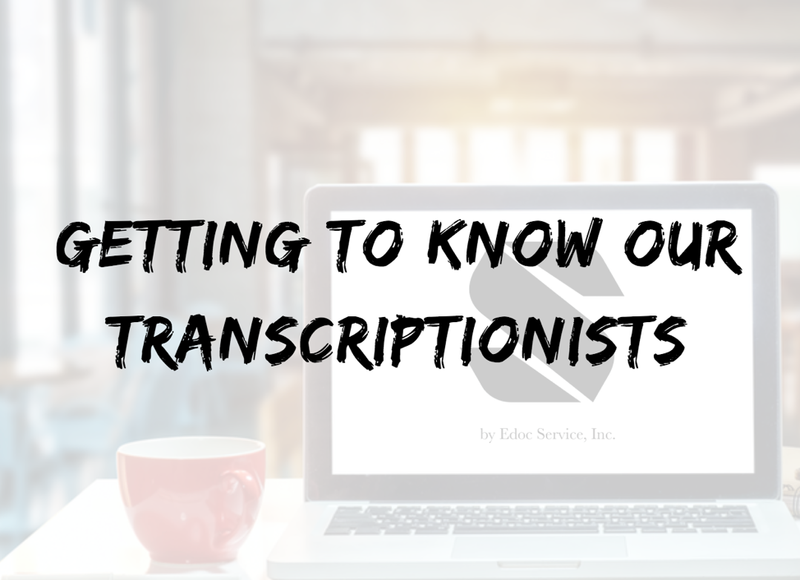 That’s why we are continuing our Q&A series with our transcriptionists so you can get to know them and hear more about how they work each day. Dotty: I live in Indiana in the same town where I was born. Dotty: I have been a transcriptionist for 31 years, starting at a hospital in radiology. I had gone to business college, focusing on word processing (this was 1986!) and medical terminology. I have worked for Edoc for 2 years. I had actually accepted another offer when Edoc contacted me, and I am so thankful! In all of my career, I have never found anything quite like Edoc, from the easy platform to my wonderful boss, Tina. Q: What do you like/enjoy about working from home? Dotty: I enjoy working from home because in Indiana we have lots of nasty weather and not having to deal with driving in the snow makes it really nice. I also enjoy not having to worry about what I am going to wear. I save a lot of money on clothes and food. I miss working with people, so from time to time I will take a part-time job outside of home like working at a gas station just to get my people fix! Dotty: Right now I live with my daughter, her husband, and my grandson who is 2 next week, and we have a baby girl due in October, so I could not be happier! 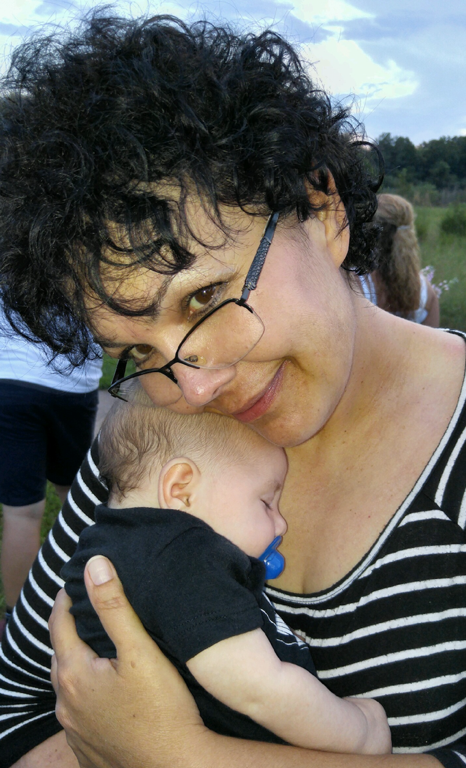 Outside of work, I enjoy spending time with my family and spending time outdoors. I count my blessings every day for the wonderful opportunity I have been given to work for Edoc. Lita: I was fortunate enough to attend high school during the late ‘60s and early ‘70s, when classes were offered that could lead to a career. Shorthand was such a class, and it was there that my talent and skill was discovered. By the 2nd semester over half of the class had dropped out, which left only a handful of us to transcribe the squiggles into a legitimate document. I did a couple of meaningless jobs 3-6 months after graduation, but within a year saw an ad in the local newspaper of Van Buren, Arkansas, for a radiology ‘typist’ — actually right now is my 45th anniversary (June/July 1973). Transcriptionist wasn’t an official term yet, we were still considered typists. I applied and got the job with only having taking shorthand and typing in high school. I sat and observed the job being done, sat in the room where the radiologists read the films, conferred with physicians, and dictated, then transcribed from a wide magnetic belt which was then played on a needle-like transcribe machine. After typing the document we would then go and place it on the patient’s chart at the nurse’s station. I delivered my own transcribed reports like that at a hospital until the late ‘80s. Selectric typewriter, 3 copies, white out and razors to tweak the print. Copies made. I even helped transport patients to and fro, and helped, once in a while, with a radiologist procedure, helping calm a child, etc. From there, I slowly worked my way into different opportunities. I wanted to transcribe everything so I would have more skills to be more marketable—radiology, pathology (typed autopsies, gross and microscopic), speech therapy, orthopedics, cardiology (had my own business for a few years). And we did our own editing/QA. Q: What do you enjoy about working from home? Lita: I absolutely love working from home. I did enjoy working in a hospital/clinic/office environment 30+ years ago but then things began to change, and hospital budgets didn’t allow much for a transcription department in Medical Records, and quarters became smaller and eventually [they went away]…I’ve been working from home on and off for 20+ years. It’s an ongoing adaptation. Lita: Be aware of personal assets and challenges. Are you a morning person, and when is your peak energy? Sometimes I keep YouTube playing in the background with ambient sounds, water, birds, to relieve the doldrums. Take frequent stretch breaks, walks. Lita: When I’m not working, I hang out with my family and take day trips. Overall, after 45 years, I simply enjoy transcription and it keeps me busy, fulfilled with accomplishment, and don’t regret the sacrifices (single working mom) I had to make because now because I have a good job to semi-retire with. Jill: I have been a transcriptionist for 19 years. Q: And how long have you been an MT at Edoc? Jill: I have been an MT with Edoc for either 8 or 9 years, I have lost count. Jill: I became an MT through my sister-in-law. She started working as an MT to be at home with her children and I was looking to do the same thing. Jill: I have loved being able to be at home with my children all of these years, with the freedom and flexibility of being able to participate in all sorts of school activities and knowing that I have not missed out any part of what has gone by so fast. Jill: I love spending time with my family, reading, watching movies.